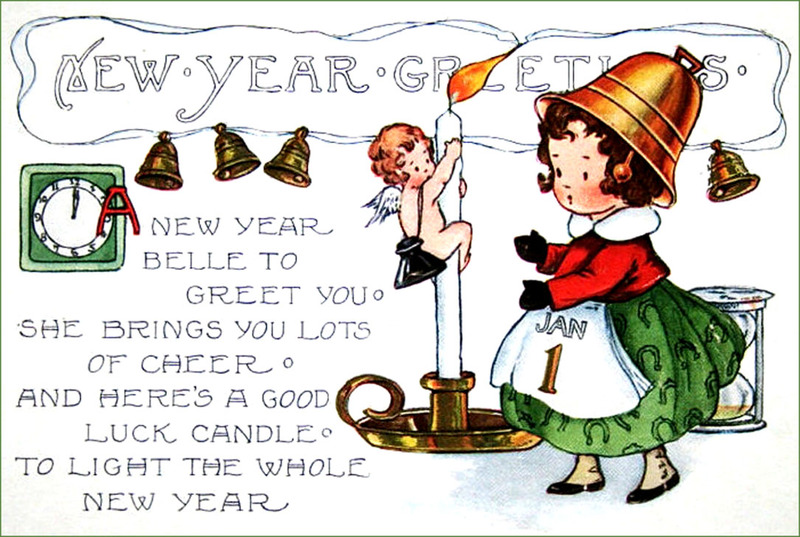 Lots of wonderful, free and printable New Years cards for you to see, enjoy and send to your loved ones. 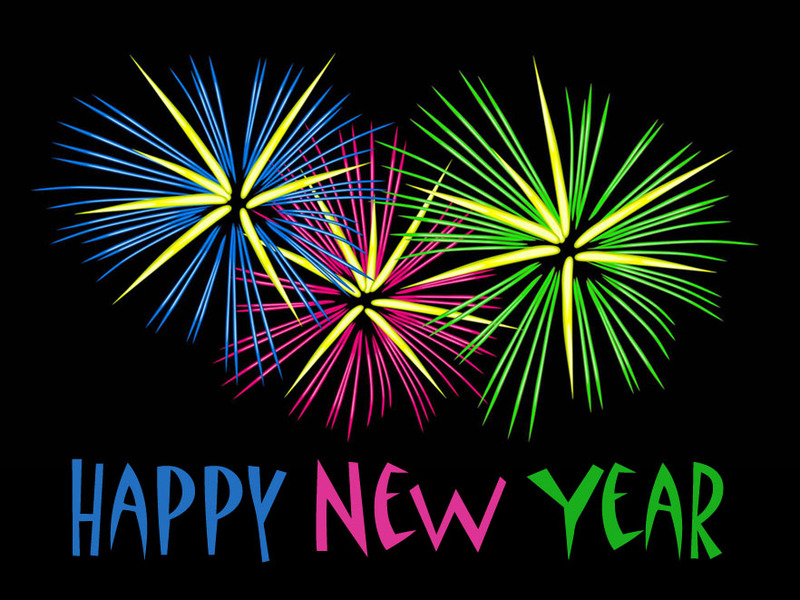 Explore this diverse, colorful and high quality collection of Happy New Year Cards to find your personal favorite. 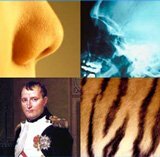 You can choose between both modern New Years Eve photos and old vintage New Year greeting cards some of which feature lovely New Years poems. The tradition of sending your greetings and best wishes is in fact very old. 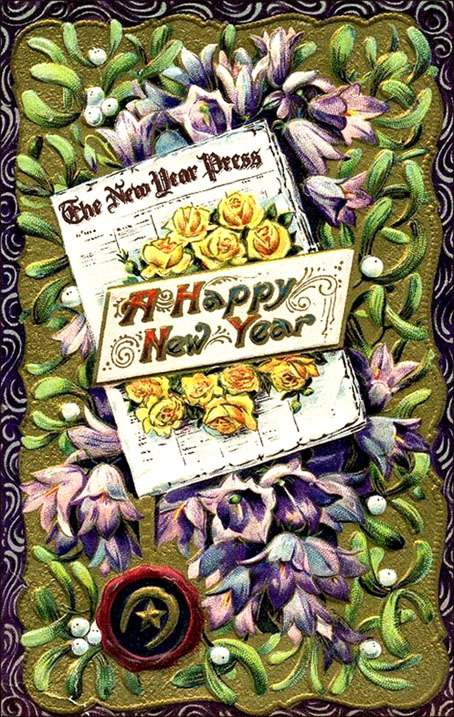 Some of earliest cultures to use New Year greeting cards date back to ancient China and the Egyptians used to scribble their dearest and best wishes down on papyrus. However, it was only by the 14-15th century that the Europeans finally caught on to the greeting cards exchange tradition. 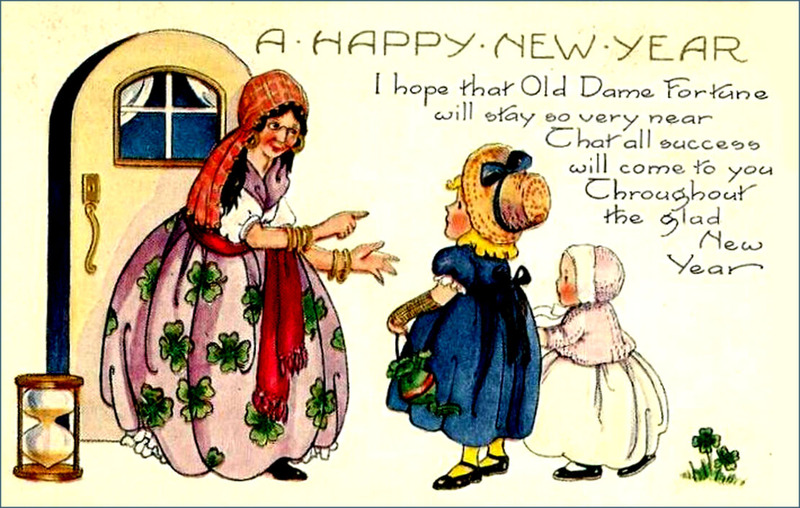 When you scroll down to look at the many New Years greeting cards below, you will notice that some of the old vintage New Year cards feature Dame Fortune as a Gypsy woman (or go here to find more Dame Fortune Happy New Year Cards). 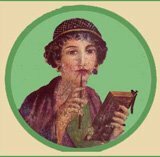 Dame Fortune or (Fortuna, as she is also called), is originally quite an ambiguous goddess of fortune in Roman religion. She can be in a good mood and bring you luck, which of course is nice! However, she can also be less charitable and bring you bad luck! Not so nice, obviously! So as you can see staying on Dame Fortune good side is definitely to prefer. What on Earth Is Death Doing on the Cards? Well, first of all the old white bearded man with the long cloak that you may see on New Years greeting cards is actually not Mr. Death himself. No, he is Father Time! Father can be easily recognized as he is often holding a scythe or an hourglass. Father Time represents changes; death being one of them. 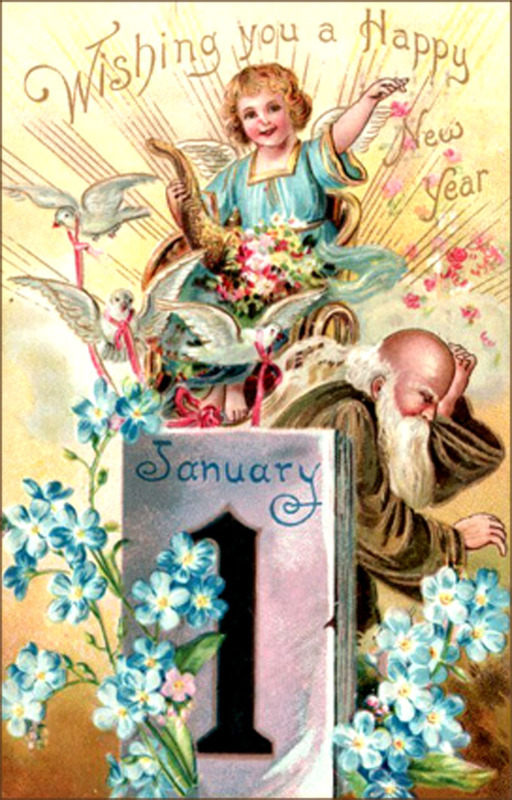 In New Years cards he most often depicted as defeated by a sweet little angel or a young woman (his wife Mother Earth). 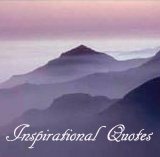 In this way his defeat may symbolize the beginning of a new life cycles starting January first. 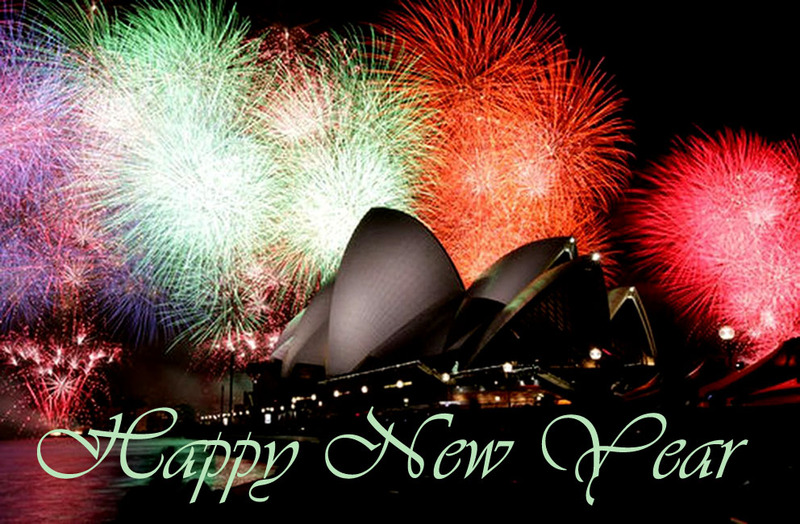 Photo of Sydney Opera House by night with many colorful fireworks in purple, green, orange and pink. 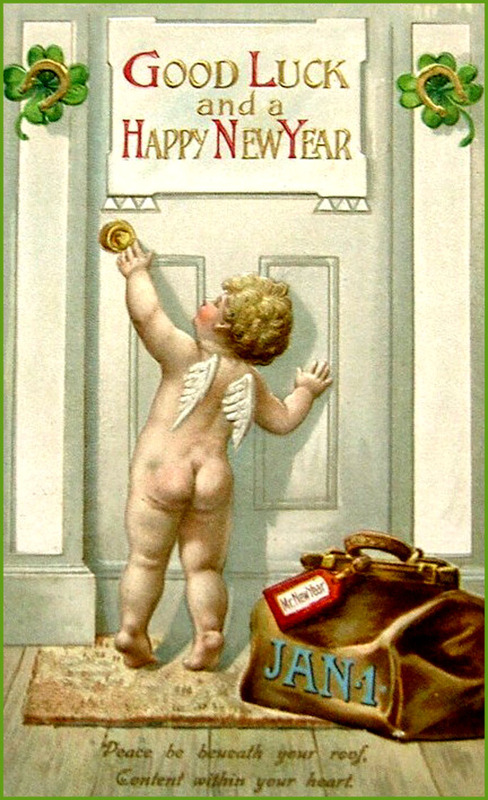 Sweet vintage New Year postcard drawing of little boy angel with a brown bag reaching for the door knob. Rhyming poem and sweet vintage drawing of little girl in Father Christmas costume pulling a rolled up piece of paper with 'Resolutions' written on it. Walking in snow landscape with big yellow moon or sun. 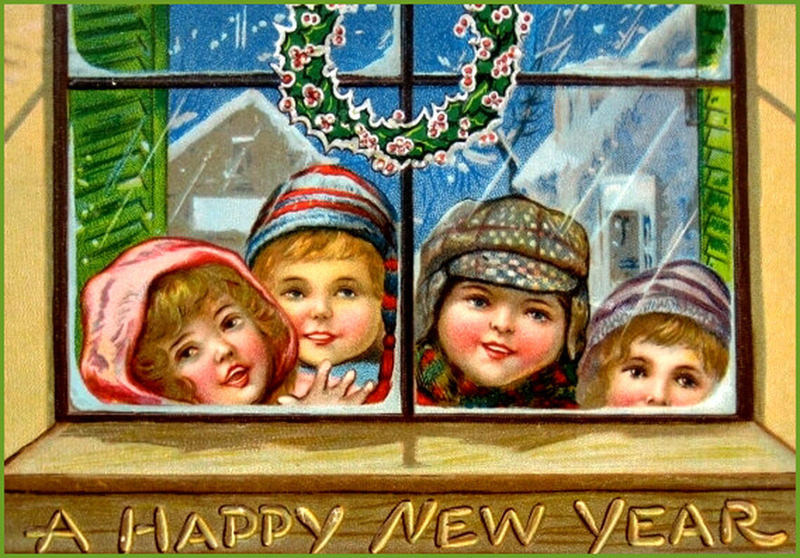 Beautiful colorful vintage New Year card with a sweet little angel in blue singing and Father Time hurrying off. Lots of with doves with pink ribbons, blue flowers in foreground and a calendar leaf with first of January. Colorful greeting card in a simple drawing style. Three fireworks in blue, pink and green. 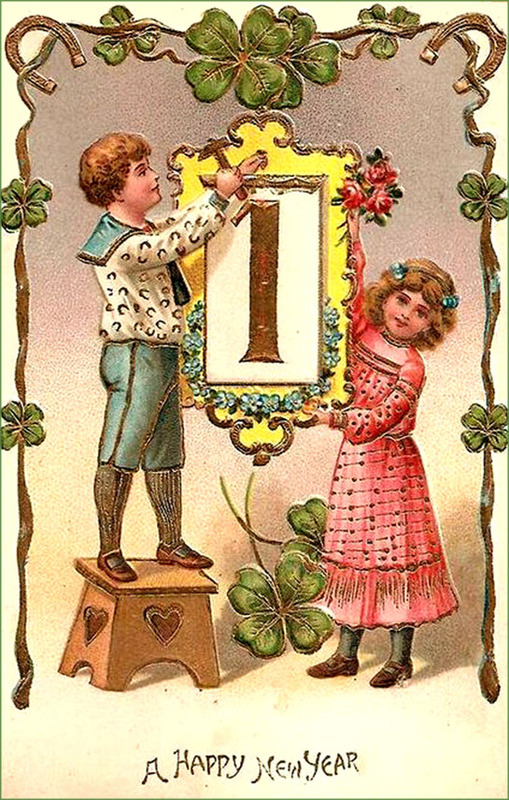 Old style drawing of boy and girl hold a framed picture with the number one: First of January. Lots of clovers for good luck surrounding the children. 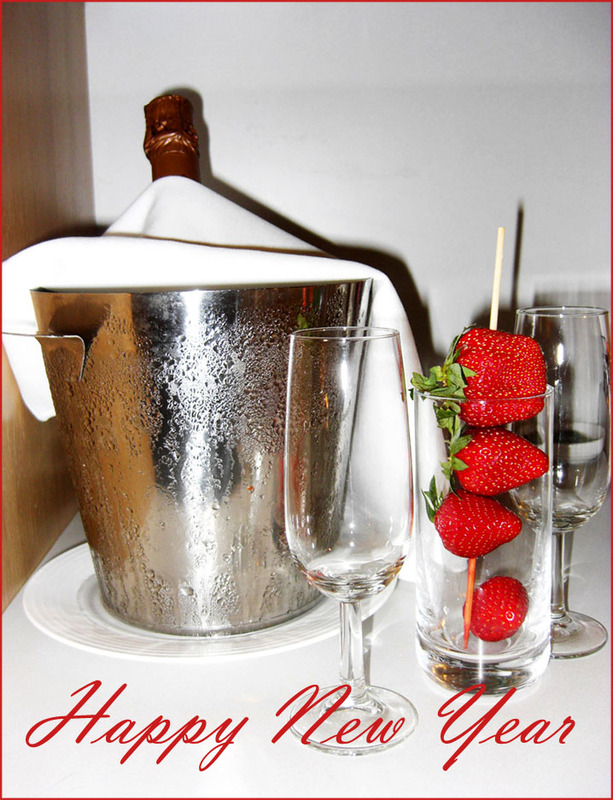 Decorative and clear photo of iced Champagne, champagne glasses and a glass with fresh strawberries. Drawing of four children, two girls and two boys, standing outside the window in winter's clothes as it is snowing. Artistic picture of colorful bubbles in blue, turquoise, orange, red and green. 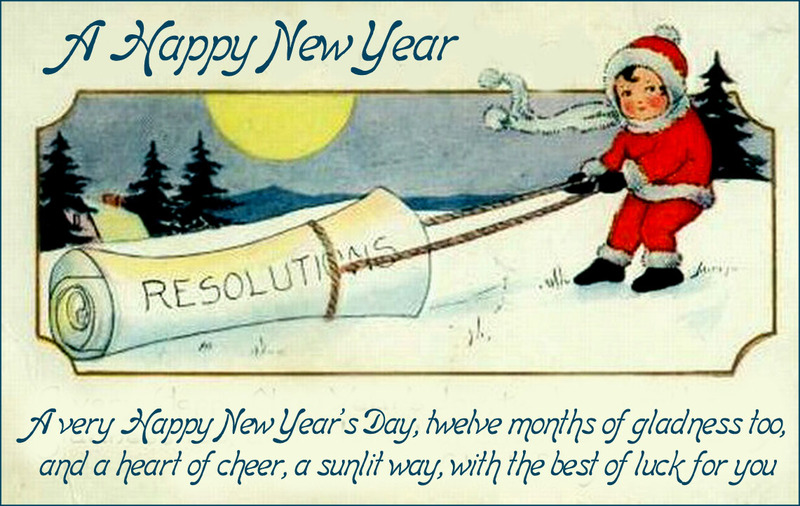 New Year's poem and old greeting card with Dame Fortune in Gypsy clothes. Dame fortune is talking to two small children. Old vintage drawing of a newspaper with yellow roses lying on a bed of purple flowers and green leaves. 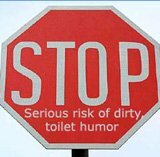 See also a golden star and horse shoe for good luck. 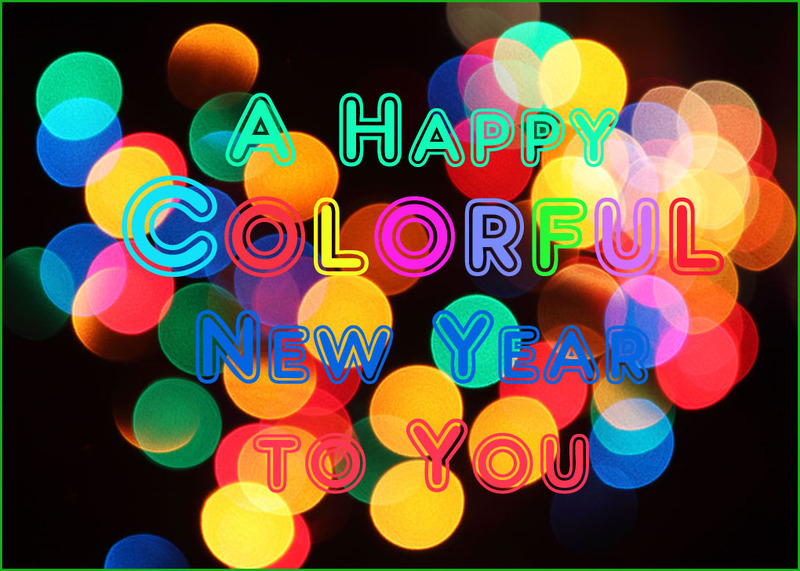 Beautiful printable photo of colorful fireworks in red, green, gold and purple. 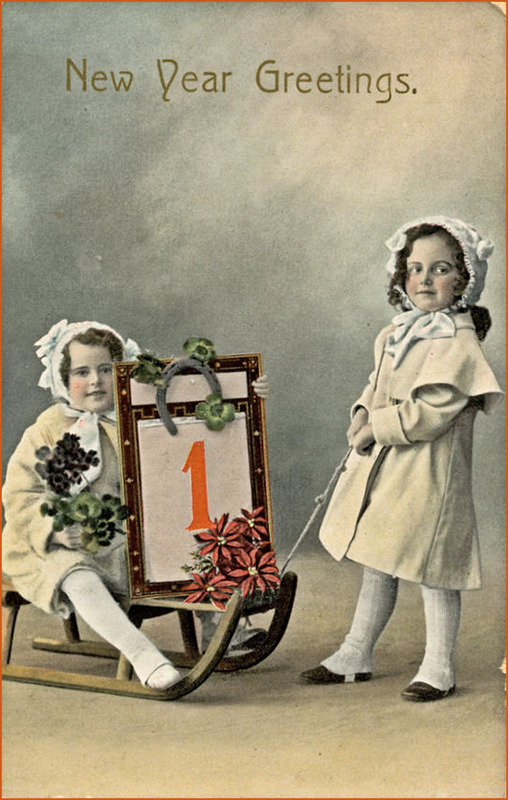 Old picture of two girls on of whom is pulling the other on a sleigh with a first of January calendar leaf. 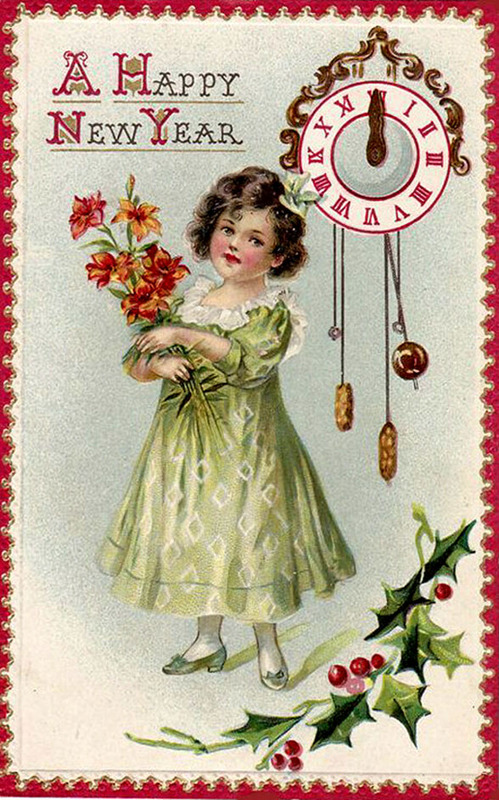 Drawing of little girl in green dress hold a bouquet of orange flowers. Old clock in the background. 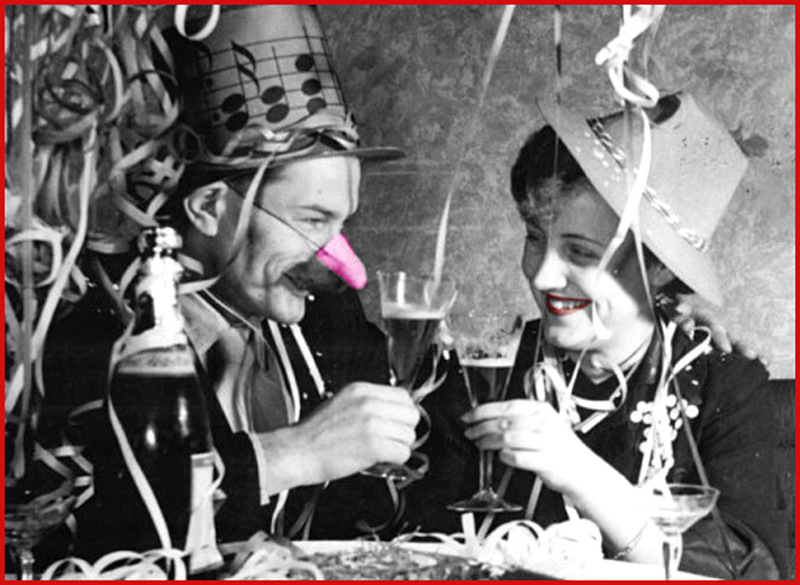 Funny old photo of New Years eve party with man and woman toasting. 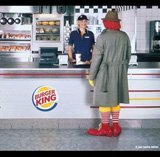 Both are wearing hats and man is wearing funny pink nose. 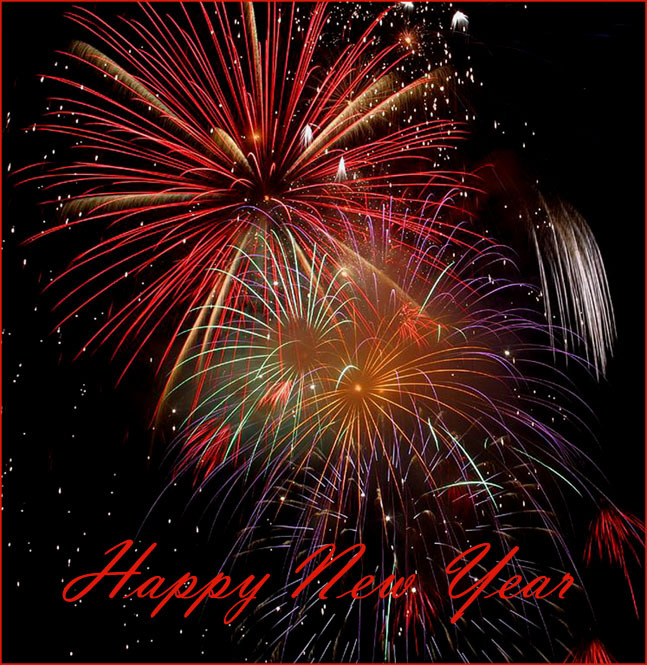 Panoramic New Years card with orange firework on black night sky. Little girl in green dress with a golden bell hat and sweet little angel climbing candle. 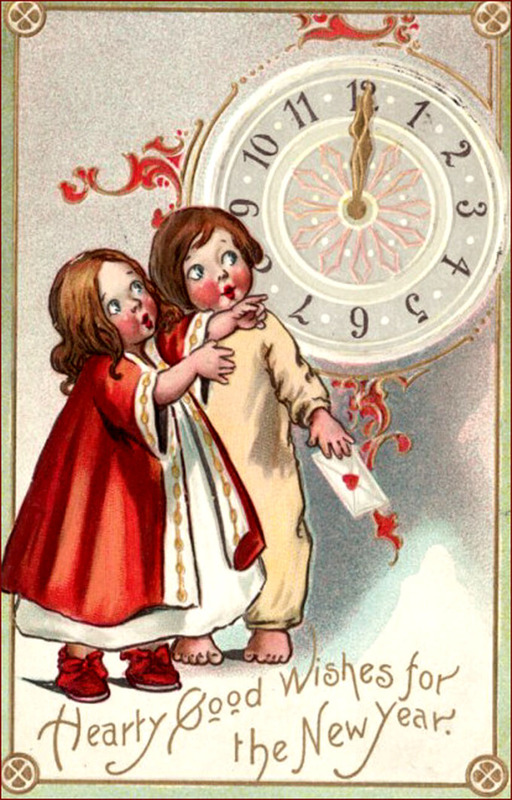 Two small children looking up at the clock showing midnight hour. One of the children is holding small envelope. 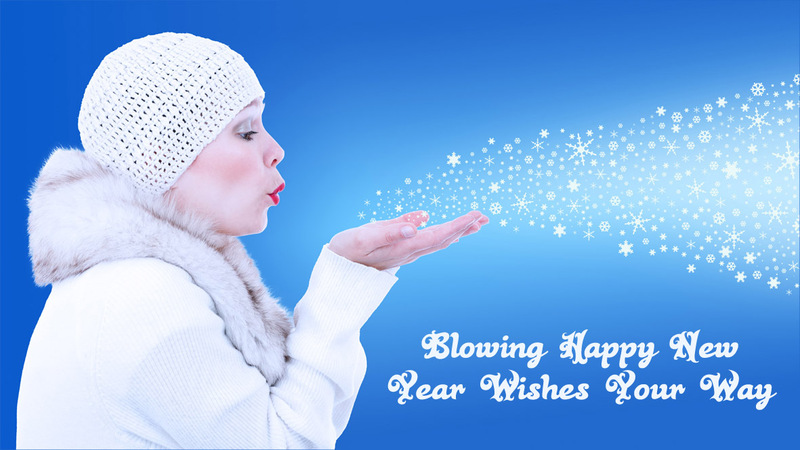 Photo of woman in white jacket blowing pretty white snowflakes from her hand. 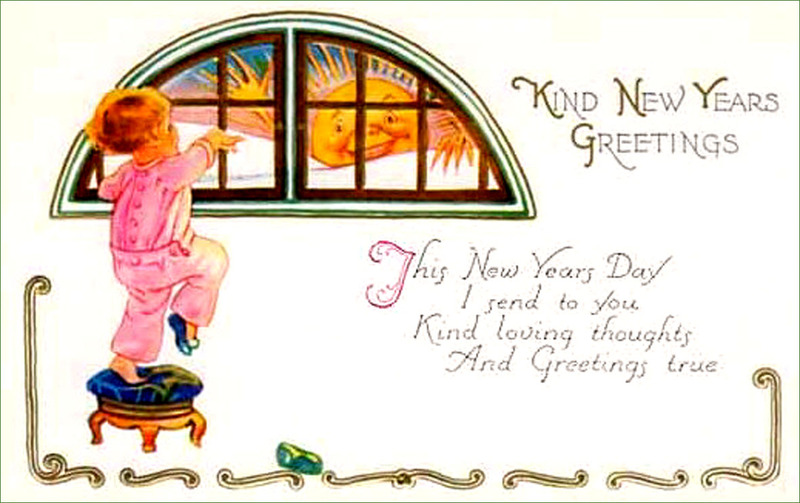 New Year postcard with poem and Drawing of woman sitting in a chair with a white fan. 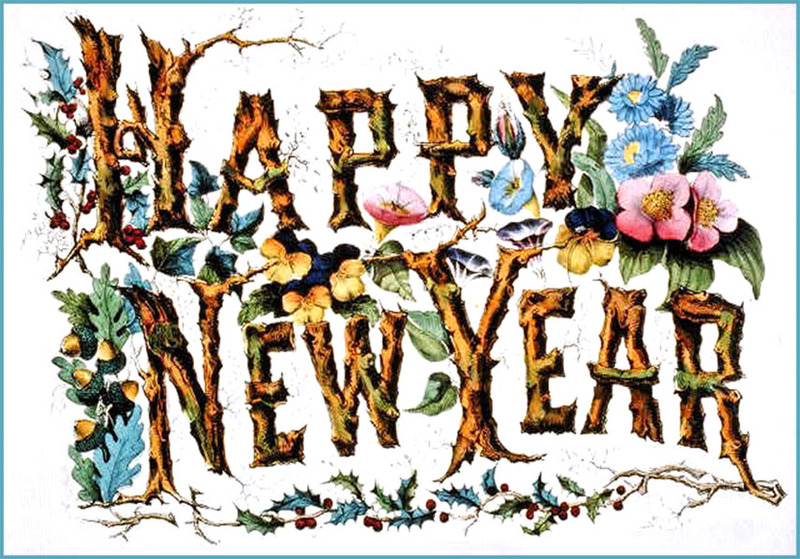 Artistic drawing of the writing 'Happy New Year' with wooden logs, colorful flowers and leaves.